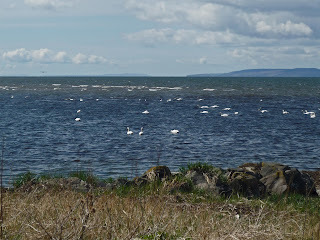 Just a few of the 80+ mute swans swimming at the mouth of the River Doon. 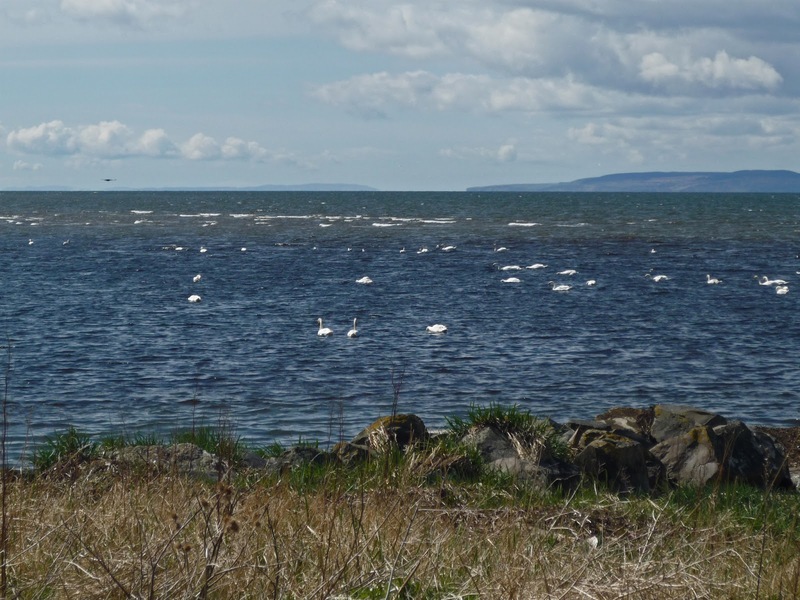 I'm now posting at Ayrshire+ Photos, although that site will continue to undergo updates/changes as I get to understand WordPress a little more. Can you please update any connections you have to point to the new URL / feeds. 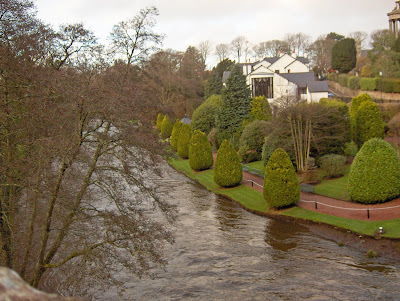 After the rain we've had, the River Doon is running as high as I've ever seen it. The building in the centre is the Brig o'Doon House Hotel with the main window of the function suite (I won't shock you with the minimum cost of a wedding there) showing. 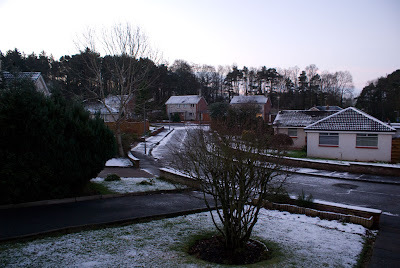 The partial building you can see in the top right is the Burns Monument in Alloway. 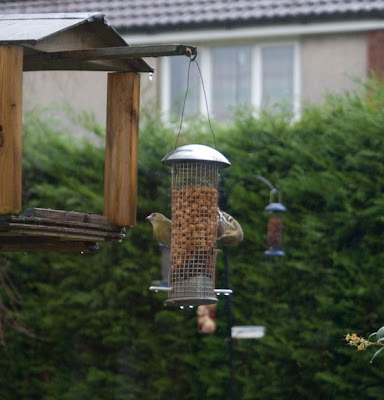 We don't get Siskins all that often, but they are welcome visitors when they do come. When I went out to fill the seeds this morning, obviously one was so intent on feeding it didn't notice me until I was within touching distance. The it took off at a high rate of knots shouting furiously!! As you can see from the bottom of the nut feeder, it's still wet! Someone was very profligate with the icing sugar last night!! I'll be moving my blog onto www.anhonestman.net in the near future, so keep your eyes open. 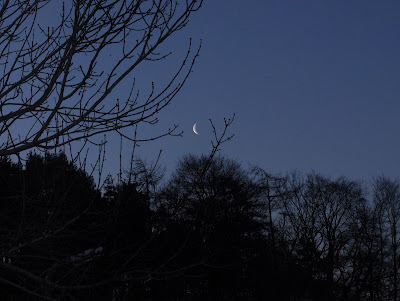 This morning as I went down to collect in my rubbish bin, the collection is very early in the morning, I saw the crescent moon through the bare trees and thought it worthy of a photograph. 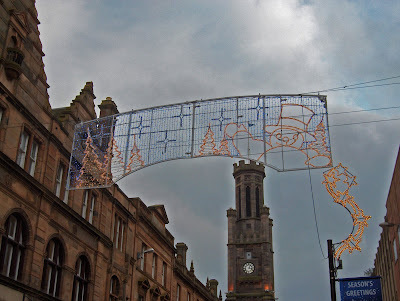 Since it stopped raining for a bit, I managed to get the camera out and took a photograph of the Christmas decorations in Ayr High Street. These are repeated up and down the street. Quite restrained.